Packing a suitcase is all about the best use of a limited space. The better you use the available space, the more you can pack or the smaller bag you need for your trip. There is no one right travel packing method. Some packing techniques are though better than others, i.e. 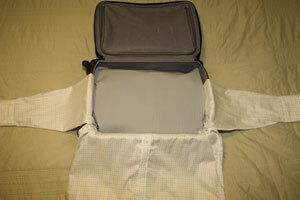 regarding the best use of space and protecting your clothes from wrinkling. 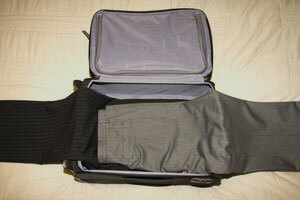 There are three main suitcase packing techniques, i.e. folding, rolling and bundle wrapping. This article explains each method in detail and with photos as well. 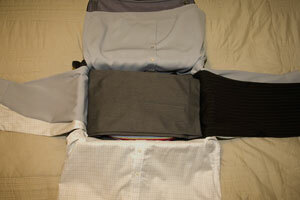 Folding is the traditional ways of packing a suitcase. It is simple to use, you just fold the clothes as you do when you are putting them away in your wardrobe. 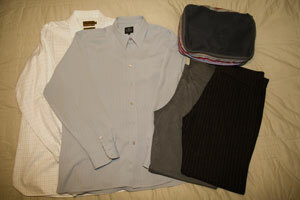 The downside is that the clothes are compressed in the bag, causing creases in the folds. 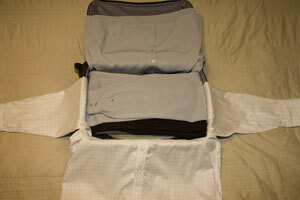 The good news is that you can significantly reduce the wrinkles by folding one item over another. This give each item some support where you have folded it, i.e. so it creases less in the folds. 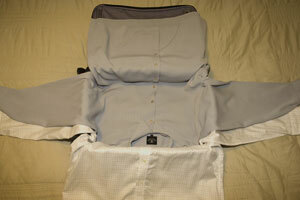 Folding is simple to do, just fold one item over the next, just like the photos show. Rolling your clothes instead of folding them does not only result in less wrinkles. 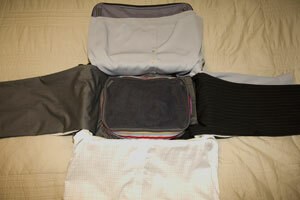 You can also fit more into your bag as the clothes takes less space when rolled. No wonder this is the favorite packing method of backpackers. 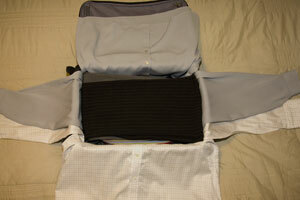 The rolling method also works great when packing a suitcase. Rolling is easy and you can roll most clothes. 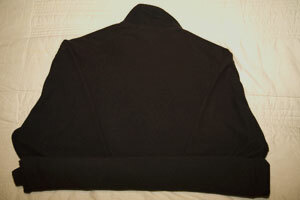 Just lay the garment down, fold back any sleeves, and roll the garment from the bottom up. 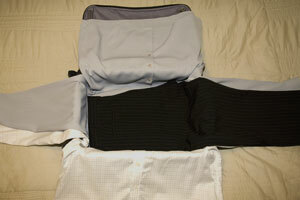 Most travelers are familiar with the folding and rolling techniques but fewer know the bundle wrapping method. 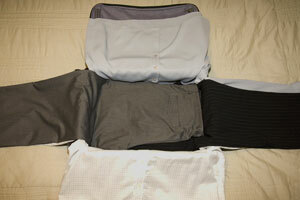 Bundle wrapping is the most complicated way of packing a suitcase though not as complicated as it may look at first. It can take little practice to master the bundle wrapping technique but it is worth it. Bundle wrapping is the best packing method in all aspects, i.e. both space and wrinkle wise. 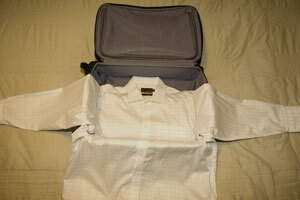 You can even pack wrinkled clothes and they will come out less wrinkled when you arrive at your destination. 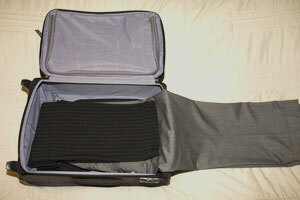 Furthermore, you can pack more clothes which always a bonus... as long as you stay within your luggage allowance. The bundle wrapping technique means you wrap your clothes around a central core object. This means no folds, so less wrinkles. Your bundle can be as big as it needs to be, i.e. depends of the number of items in the bundle. The final bundle of all your clothes will look kind of like a pillow. You should be able to pick it up in one piece. When unpacking your bundle, just work your way through the bundle in reverse order. 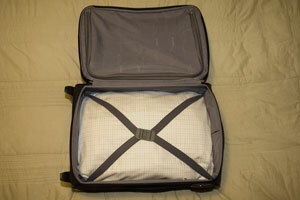 Sometimes you don´t want to unpack your bag at your travel destination, e.g. when only staying for a night or two and then moving on. You can then take out some items from your bundle and rewrap it. 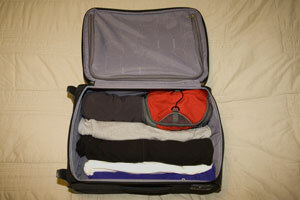 Your clothes will stay in much better shape than if left folded or rolled in the suitcase for couple of days. The following photos show the bundle wrapping technique step-by-step. 8. Continue Wrapping Up Sleeves, Trouser Legs, Etc. We now always use the bundle wrapping technique when packing a suitcase. Because it works, the clothes are in better shape when we arrive at our destination and we can pack more, which we always seem to need. We recommend trying the bundle wrapping technique next when packing a suitcase. It is not as complicated as it may look at first glance and we are sure that you (like us) will be pleasantly surprised with the outcome. 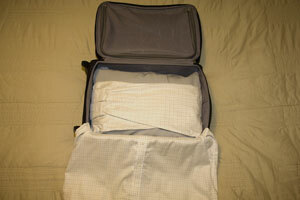 This video offers further travel packing tips for packing a suitcase.